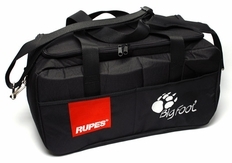 For a Limited Time receive Rupes Big Foot Detailing Apron with your purchase of this Polisher! Retail Value $21.99. The Rupes LHR 15ES reminds me of my favorite drop-top Ferrari– the California. Like the Ferrari California, the Rupes LHR 15ES is conservatively handsome and loves to work hard. Both machines are engineering marvels and will always make you come back for more. While I don’t always have access to a Ferrari California (my neighbor finally cut me off), I can get my hands on a Rupes LHR 15ES and my favorite set of Wolfgang polishing compounds any time I’d like, so I decided to assemble what is undoubtedly the best Rupes LHR 15ES polishing kit available – the Wolfgang Rupes LHR 15ES Ultimate Polishing Kit. 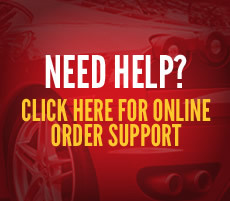 What’s the big deal about the Rupes LHR 15ES? For one, it’s an Italian-bred workhorse that was designed from the get-go to remove paint imperfections, like swirl marks and oxidation. Secondly, it does so without breaking a sweat, especially when paired with Lake Country Hydro-Tech foam pads and Wolfgang’s most versatile pair of swirl-destroying polishing compounds, Uber Compound and Finishing Glaze. 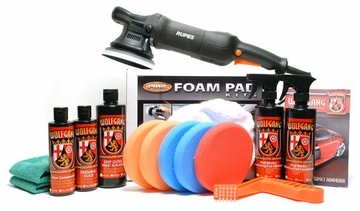 Throw in a couple essential polishing accessories like the nifty Foam Pad Conditioning Brush, Wolfgang Pad Werks pad care products and a handful of microfiber towels, and you have the Wolfgang Rupes LHR 15ES Ultimate Polishing Kit….the perfect marriage of German and Italian ingenuity. A German/Italian relationship has never been this good. Enjoy! The Rupes LHR 15ES Big Foot Random Orbital Polisher is the smoothest running random orbital polisher available. Like a fine Italian sports car, the Rupes LHR 15ES features remarkable engineering and exquisite craftsmanship; the ergonomics along with fit and finish on the LHR 15ES Big Foot Random Orbital Polisher are superb. The soft-start system guarantees an acceleration ramp to prevent accidental dispersion of your compound and polish while the electronic feedback control maintains constant speed in all applications. Total retail value of $606.85. You save $106.86!